Bath salts for a relaxing mineral bath. Dissolve 500 grams in a bath of hot water. 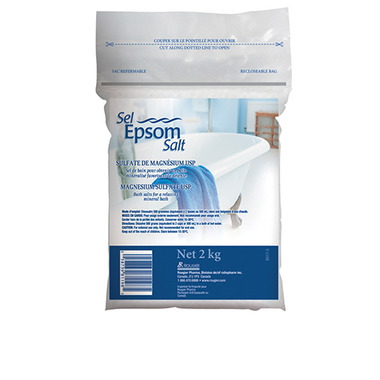 Epsom Salts is the first step toward a calming bath and tranquility. Try for yourself and make bath salts with essential oils with this formula on our blog, The Well. Great price for the amount that you get in this bag! I put 1/4 cup of this into my post-run bath every night and it really helps ease my muscle stiffness. Love the size of the bag (since I go through a lot quickly) and the price! Also, you can't beat having it delivered to your door! I have major muscular aches that require Massage Therapy treatments weekly or bi-weekly so really need to soak in Epsom Salt baths regularly. Perfect product for me. Put together a mother's day gift basket for my mom with this in it, she had the longest most relaxing sleep she's had in a long time! I've been using it for my plants, they look greener and healthier!